This week ClaroLux® was in San Antonio, Texas enjoying the beautiful weather and great company at the annual AOLP Annual Conference & Expo. ClaroLux® was proud to be one of the Gold Sponsors of the 2015 show. The AOLP Conference took place at the beautiful Hyatt Regency Hotel. It was an absolutely beautiful place and was the perfect setting for the AOLP Expo. We would just like to say thank you to all of the members and speakers for a wonderful trip that was put together. A special thanks to the 2015 AOLP Executive Board Members including Matthew Broyles (President), Paul Welty (Vice President), Gerry De La Vega (Treasurer), John Niggli (Secretary), Paul Gosselin, John Niggli, Michael Deo, Victor Samano, Lisa Frye (Executive Director). Thank you all again for the time and effort that you put into the AOLP expo and conference. Each and every year it gets bigger and better. If you are looking to expand your knowledge in the industry please visit the AOLP website. 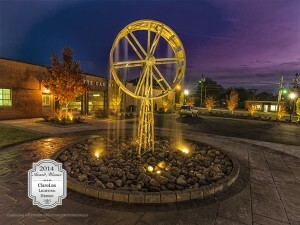 AOLP offers many certification programs for outdoor lighting designers and professionals including COLD and CLVLT. Many companies today in the market place offer fixtures that do not carry the proper electrical listings. What does this mean to you? When a fixture or electrical component is not properly tested by UL (or any other electrical listing entity), this fixture becomes a liability to your company. No matter which brand of fixtures you are thinking of using, keep in mind the necessity of proper electrical listings. 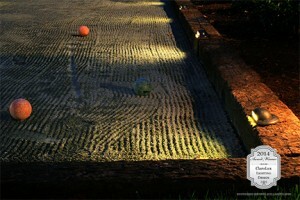 All projects that are going in the ground today have the right to be inspected. Even if you are not pulling the proper permits prior to the project being installed inspectors still have the right to inspect your work. This means if you are installing a project and your local electrical inspector happens to drive by, he will most likely stop to check to see that you have the proper permits and are installing properly listed equipment. This is becoming more and more prevalent due to electrical fires that are occuring from inproper installation techniques and non-listed fixtures (fixtures that are usually imported from China). There is just far too much product being sold (from a variety of sources) that does not carry the appropriate listings. You as a professional installer must be certain that the components you are installing are properly inspected and listed. If the lighting fixtures that you are using are not properly listed, you could find yourself in a situation where your insurance is void and you are liable for anything that might happen to the system you have installed. Even if nothing ever happens to the system (safety wise), if your local electrical inspectors find unlisted product being installed they can take action against you. Be smart! Use properly listed products and help to protect our industry! 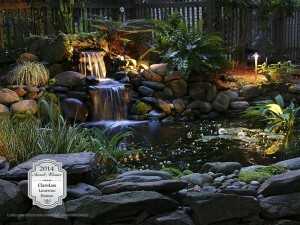 All ClaroLux Landscape Lighting products are UL Listed and meet UL code 1838. 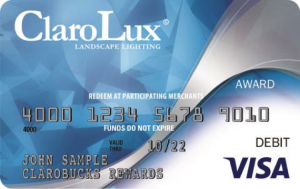 ClaroLux® is very excited to announce their new and improved 2015 ClaroBucks Rewards Program with the launch of the ClaroLux Visa® Prepaid Card. In 2015 you will earn up to 2% of your net purchases which will be loaded onto your ClaroLux® Card. To kick off the program ClaroBucks Rewards earned in 2014 will be loaded on your ClaroLux® Visa Prepaid Card and distributed in March. Your card can be used at approximately 170 popular retail, travel and entertainment establishments. You can use your card online or in person, making it easy for you to shop, dine, and have fun! The ClaroLux® Visa Prepaid Card is a reloadable card which means ClaroBucks will be added to your card each quarter as long as you have made qualifying purchases. The ClaroBucks program is open to ClaroLux® Dealers in good standing that make a minimum of $5,000 in annual ClaroLux® purchases. The percentage of purchase dollars awarded to your account is dependent on your annual purchase volume. For full program details please visit ClaroLux’s Dealer website and click on the ClaroBucks Rewards tab within the dealer section. Visit MyPrepaidCenter.com to see the current listing of participating merchants*, to check your card balance, and get questions answered about your card. Note: your card is a prepaid card and not a credit card, which means you cannot pay with the card beyond the available balance. You can only use the funds available on your card. Each time you use your card, funds will be deducted from your card balance. This card cannot be used at ATMs or to get cash back from merchants. If your card has a balance after the card expiration date, a $2.50 monthly fee will be accessed on your card until the balance reaches zero. *Merchants are subject to change. Prepaid cards are issued in connection with an award program. Prepaid card is issued by MetaBank®, Member FDIC, pursuant to a license from Visa U.S.A., Inc. No cash access or recurring payments. Can be used at select merchants that accept Visa debit cards, see website below. Card valid for up to 24 months, funds do not expire and may be available after card expiration date, monthly card account management and post-expiration card re- issuance fees may apply. Card terms and conditions apply, see MyPrepaidCenter.com. As we all know, the effects of salt water on landscape lighting systems and coastal environments are very hard on man-made objects. With the recent surge in the market antique brass landscape lighting fixtures many landscape lighters are not considering the long term affects of using brass instead of copper. Antique brass fixtures are great because they offer a beautiful patina look right out of the box. So unlike copper you do not have to wait for the fixture to patina. So from day one, you get the natural aged look. But with most brass fixtures on the market you tend to lose that beautiful aged look within a few weeks of being outside near the coast. There are many variables that can help you to choose what metal is best for you…the first and most important variable is the environment that you live. 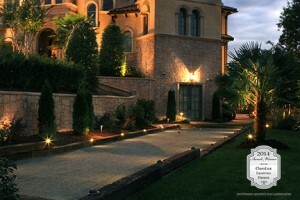 Over time a landscape lighting system is only as good as the materials that they are constructed of. If you live within three miles of a brackish or saltwater environment then you know what happens to outdoor products of any kind. Outdoor lighting fixtures take a beating when installed in these areas, that is why it is important to find the right light fixtures for the right areas. 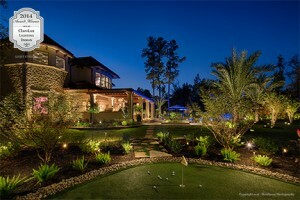 Even if you don’t live near the coast using landscape lighting fixtures made from materials that will last is paramount. 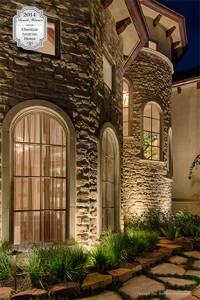 At ClaroLux®, we offer several different types of materials for every budget and environment. If you live near the coast then we have two products that we recommend that you can choose from – copper and brass. Solid Brass Lighting Fixtures – If you are looking to use primarily brass and you are located near the coast then you will need to understand that the brass look that you purchased will not always look like it did when it was first installed. Cast brass outdoor light fixtures are designed to stand up well to salt corrosive environments but the brass material will patina with age. Most raw brass or bronze fixtures must be rinsed to control the salt build-up. 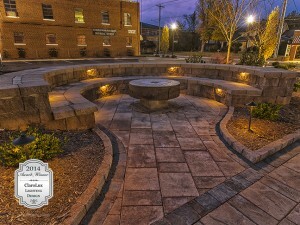 Solid brass outdoor fixtures can come in different finishes like bronze and brushed nickel made by creating a chemical reaction. ClaroLux’s® brass line has a limited lifetime warranty and is designed specifically for coastal environments. Their brass fixtures also come with ClaroLux’s® patented protectant sealant that helps to preserve the finish and material for many years to come. 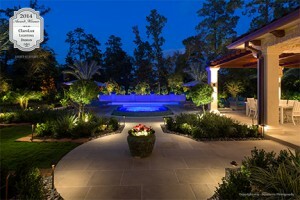 The fixture shown here was manufactured by one of the top landscape lighting companies in the country. This particular fixture does not come with a protectant sealant to preserve the antique brass finish. The photo was taken by one of ClaroLux’s® Dealers in Puerto Vallarta, Mexico after two months of being installed. 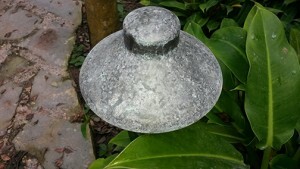 The photo shows how salt water environments can destroy the finish on some landscape lighting fixtures in a very short period of time. The harsh coastal climate in Puerto Vallarta is one of the reasons for this particular dealer switching to ClaroLux’s® brass line. He loves the brass look but was having a hard time finding a lighting company that could help him with his request. ClaroLux® delivered not only a product that could stand up to the test of time but also remained as beautiful as the first day it was installed. Solid Copper Lighting Fixtures – – Copper is ClaroLux’s® number one seller to their Dealers in coastal environments. 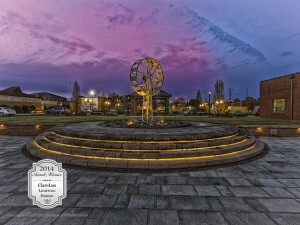 ClaroLux’s® copper landscape lighting fixtures are designed to stand up well to salt corrosive environments but will need to understand that the polished copper look will patina with age. ClaroLux® recommends to rinse your light fixtures off periodically to control the salt build-up. 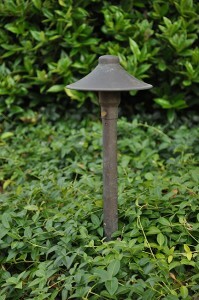 Solid copper outdoor fixtures can come in different finishes like polished, brushed or stained copper. Beware of copper plated aluminum fixtures that are advertised as copper fixtures. ClaroLux’s® copper line has a limited lifetime warranty and is designed specifically for coastal environments. The fixture shown here is ClaroLux’s® CL-AL1-I copper landscape lighting fixture that was installed 0.5 miles away from the coast. 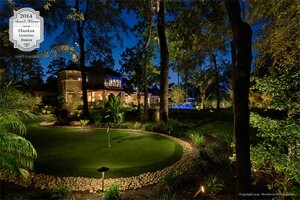 The photo was taken by one of ClaroLux’s® Dealers in Charleston, South Carolina after three months of being installed. As you can see the shinny polished copper look is now a nice brown/green patina. Copper is one of the most durable metals that also gives you that beautiful natural patina look. Copper lighting fixtures tend to patina better than any other affordable raw material on the market and that is why copper is ClaroLux’s® #1 choice for coastal environments.